In 2018, the FDA approved an all-time record of 62 new therapeutic drugs (NTDs; see Fig. 1 for the definition and the difference compared with new molecular entities). This is consistent with the increase we predicted last year (Nat. Rev. Drug Discov. 17, 87; 2018) and the overall resurgence of R&D in the last 5 years, with an average of 51 approvals per year in this period even with a low count in 2016. This is substantially more than the average of 31 approvals per year in the period 2000–2013 (Fig. 1). Fig. 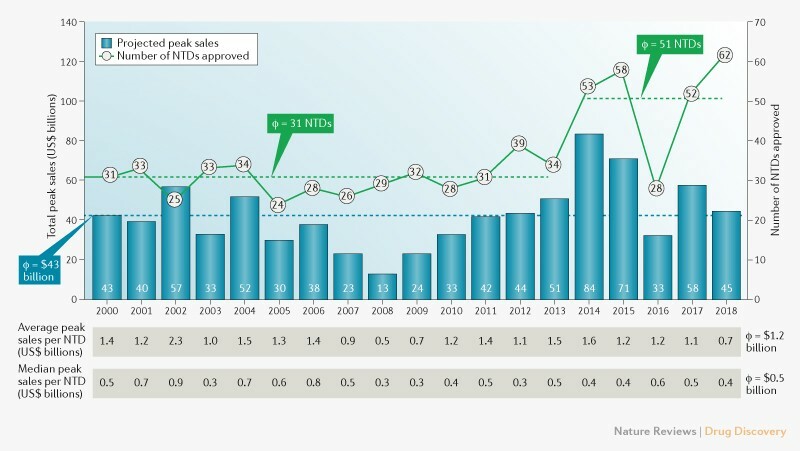 1 | FDA approvals of new therapeutic drugs and aggregate projected peak global annual sales: 2000–2018. We analysed 2018 FDA approvals of new therapeutic drugs (NTDs), defined as new molecular entities approved by the FDA’s Center for Drug Evaluation and Research (CDER) and Center for Biologics Evaluation and Research (CBER), but with two adjustments: first, we excluded diagnostic imaging agents; and second, we included combination products with at least one new molecular entity as an active ingredient. The analysis is based exclusively on approvals by the FDA and the year in which the first indication approval took place. All peak sales values were obtained from EvaluatePharma and were inflation-adjusted to 2018 using standard global GDP-based inflators sourced from the Economist Intelligence Unit. To arrive at peak sales for each NTD, we reviewed both historical actual sales as well as the full range of forecast sales that are available from EvaluatePharma and selected the highest value. Sources: EvaluatePharma, FDA and Boston Consulting Group analysis.